Some children have a combination of severe disabilities. We say they are 'multiply disabled'. 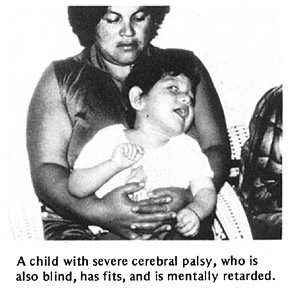 For example, a child may be severely mentally retarded, and have little or no physical control of his body. He may also be blind or deaf, have fits, or have difficulty swallowing. Or he may have any combination of these disabilities-and perhaps develop severe behavior problems. Caring for multiply and severely disabled children is never easy; they need an enormous amount of time, patience, and love. In most communities, parents and close family members will be the main care providers. But parents will need a lot of support from the community in order to care adequately for the child. Unless parents have help, they are likely to find that the continual demands of caring for their child are too much. Even the most loving parents, after months and years of continuously caring for a severely disabled child, can easily become frustrated and angry. This is especially true when the child shows little progress or response, and grows up to be a physical adult with the needs of a young child. It is not uncommon for a parent who for years has poured love and attention into a severely disabled, retarded child, to suddenly hit the child or in other ways begin to neglect or mistreat him. Before we blame the parent for this, we should try to put ourselves in her position. She has given the child her total love and attention for years. She has waited for a change, for a smile, for some return of warmth and love. But the child remains like a newborn baby, becoming stiffer, more fussy, and more difficult to lift and care for as he grows. Any human being can only give so much without receiving something in return, some sign of recognition or appreciation. In time, the parent is overcome by the unfairness of the situation: the lack of appreciation, the constant demands, the lack of help, the hurt. She reaches her limit and hurts the child in return. Rather than blame her, we should try to understand her. Above all, we should look for ways to help both the family and child - if possible, long before the mother or other family members reach their limit. There are several ways in which the community can give assistance to the family of a severely disabled child. In some countries (usually wealthier ones), the most severely retarded, multiply disabled children may be taken care of in special care centers, or 'institutions'. Although in many cases it is better for the disabled child to stay at home with his own family, there are times when institutional care is needed. This may be because of difficulties in the home situation. Or it may be because the multiply disabled child requires more time and skill than the family can handle. Institutional care, however, is very costly, and is usually possible only if government pays for it. Few governments of developing countries are willing or able to do that. This means that in poor countries-and especially in the rural areas-most support and assistance for these families must come from the communities themselves. The community rehabilitation workers can regularly visit the home of the severely disabled child and give suggestions, assistance, and friendship. They can help make or provide special seating or equipment that can help the family to manage the child more easily. They can teach the family ways to help stimulate the child's development and can plan with the family a step-by-step approach toward reaching realistic goals. Perhaps they can start something like a 'day care center' where the rehabilitation workers, different parents of disabled children, other concerned parents in the community, or unemployed young persons take turns caring for the disabled children for part of the day. This could be done on a volunteer basis. Or money to pay for caretakers could be raised by the community, either through donations, raffles, bake sales, musical events or other fund-raising activities. It is very important that the mother and family have rest periods from caring for their severely disabled child. Such rest periods can often make the difference between whether or not they can handle difficulties and keep treating the child in a loving, supportive way. In some cases it may be better to provide 'day care' in the child's own home. Again, the community may be able to provide either volunteers or paid care-providers. Whatever the case, often it is too much to expect the family of a severely, multiply disabled child to care adequately for the child, unless the community offers generous help and support. In deciding how to care for and work with the child who has a combination of severe disabilities, it is important to evaluate as best you can both her disabilities and possibilities. Especially in the very young child, this may not be easy. You must be ready to see new signs and change your evaluation. This, in turn, may change your plan for working with the child, so as to best help her to develop whatever skills and responses are possible. In evaluating and planning activities with the child, try to be realistic. Do not expect too much, because this can lead to disappointment. But at the same time, do not expect too little. For example, a child with a serious physical disability who is also deaf and/or blind may appear to be mentally retarded simply because her ability to experience and respond to things around her is very limited. The child may, in fact, have a lot more mental capacity (or possibility) than she appears to have. It would be wrong not to look for ways of reaching, developing, and appreciating her mind. However, this may take great patience and creativeness by those caring for her. To help her to be physically comfortable, clean, safe, and well-fed. To help her with positioning and exercise to prevent further deformity, and to make caring for her easier. To help her learn whatever basic skills she can-in developing head and hand control, and in some form of communication. Also, help her learn to interact with others in a way that her needs are met and her behavior is acceptable. To make caring for the child easier and more enjoyable for those who are responsible for her. 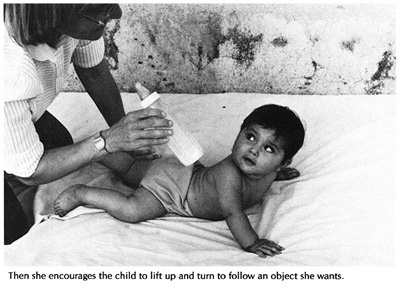 Much of the information and suggestions in Chapters 34 and 35 on early stimulation and development may be helpful for the multiply disabled child. Look for areas of development where the child seems to be most ready or to have possibilities. Then work out a plan of activity, stimulation, and rewards that will take the child forward one small step at a time. Some of the suggestions included in Chapter 40, "Ways To Improve Learning and Behavior," may also help. However, you will need to apply them with much patience and repetition. To help meet the needs of the multiply disabled child, you will also find useful information in the chapters on the different disabilities that affect the child. Special seating and positioning, discussed in Chapter 65, may help the child to have more control of her body. This can make feeding, basic communication, and other activities easier. CAUTION:Breast feeding is healthier than bottle feeding. It is usually better to use a toy or rattle to draw the child's attention rather than a bottle.